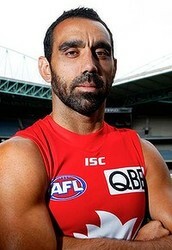 Adam Goodes is a champion Australian Rules football player with the Sydney Swans. Adam holds an elite place in AFL history, winning two Brownlow Medals and two premierships. But Adam didn't become Australian Of The Year for being a great AFL player he became Astralian Of The Year Adam is proud of his Indigenous heritage, and is actively involved with several Indigenous sport and community programs. He has spent time working with troubled youth, including those in youth detention centres. Together with his cousin and former teammate Michael O’Loughlin, Adam established the Go Foundation which empowers the next generation of Indigenous role models in all walks of life. Adam co-chairs the foundation, focused on promoting education, employment and healthy lifestyles. Adam is a great role model and advocate for the fight against racism both on and off the field and is admired by a great many people around the nation. Adam was born in South Australia, to Lisa May and Graham Goodes, with siblings Jake Brett Goodes' father is of English, Irish and Scottish ancestry; his mother is an Indigenous Australian. As you can tell Adam is an amazing person and i believe that he deserves this he has done so many amazing things and should definetly be thanked.